Caponata. 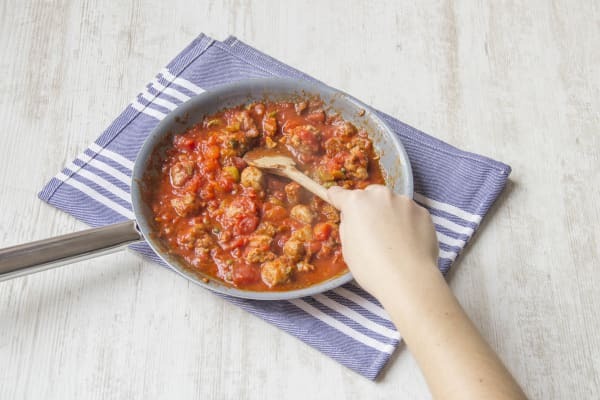 Patrick learned how to make this dish whilst filming in the beautiful coastal town of Catania and (in a fairly risky move) has decided to recreate it with a few of his own flavours. Italians are fiercely protective of their recipes so, for his sake, let’s keep this one under our hats. Buon Appetito! Pre-heat your oven to 220 degrees. Slice the aubergine in half lengthways and then slice each half into five strips. Chop the aubergine into 2cm cubes, finely chop the celery and peel and chop one clove of garlic. Remove the core from the pepper and chop it into little bite-sized chunks. 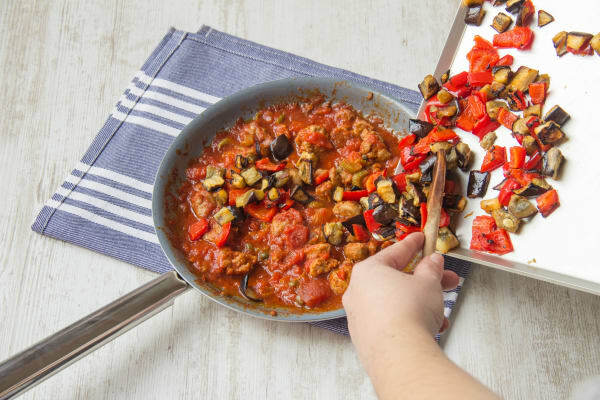 In a bowl, coat the aubergine and pepper in 1 tbsp of olive oil. Spread evenly on a baking tray and roast on the top shelf of the oven. Cook for 20 mins or until a little crispy around the edges. Heat 1 tbsp of olive oil in a large non-stick frying pan on medium heat. Once hot, add in the celery and garlic with a pinch of salt and pepper. Whilst this cooks, slice open the sausage, discard the skin and add the meat to the pan. Break it up and cook for 5 mins. Tip in the chopped tomatoes and then refill the tin a quarter with water. Swill the water around and add this into the sauce. Add 1/4 tsp of salt, 1 tsp of sugar (if you have some), the capers and 1 tbsp of white wine vinegar. Leave to simmer and thicken up for 10-15 mins. 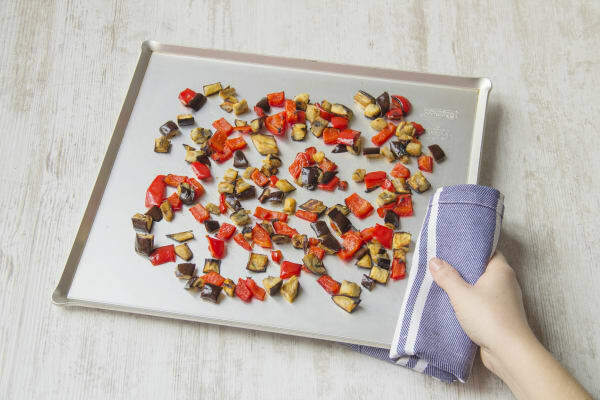 Once the vegetables have roasted, remove from the oven. Turn your grill to high. Add the roasted vegetables into the pan and stir. Cut the ciabatta in half and toast on each side under the grill. Once toasted, cut the remaining clove of garlic in half. Rub the half cloves of garlic across the top of each ciabatta. Drizzle over a little olive oil and a pinch of salt. 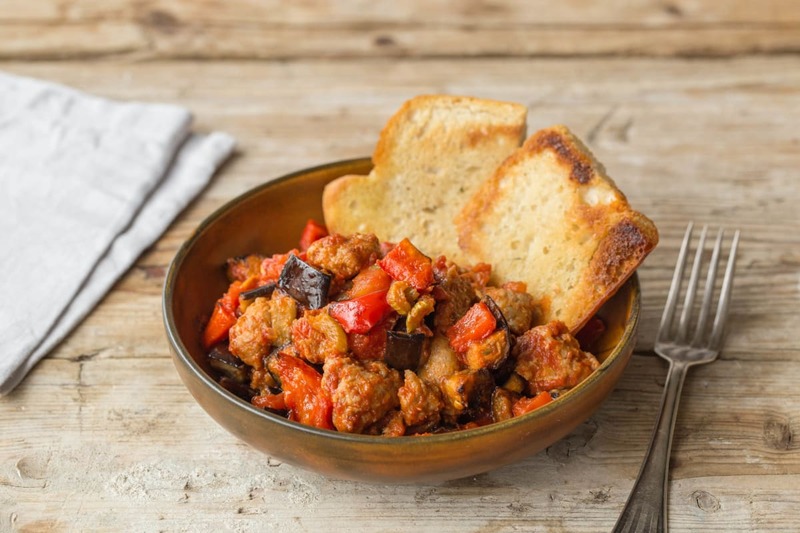 Once the caponata has thickened up, serve into warm bowls. It can be eaten with cutlery or by using the ciabatta as a small edible shovel!